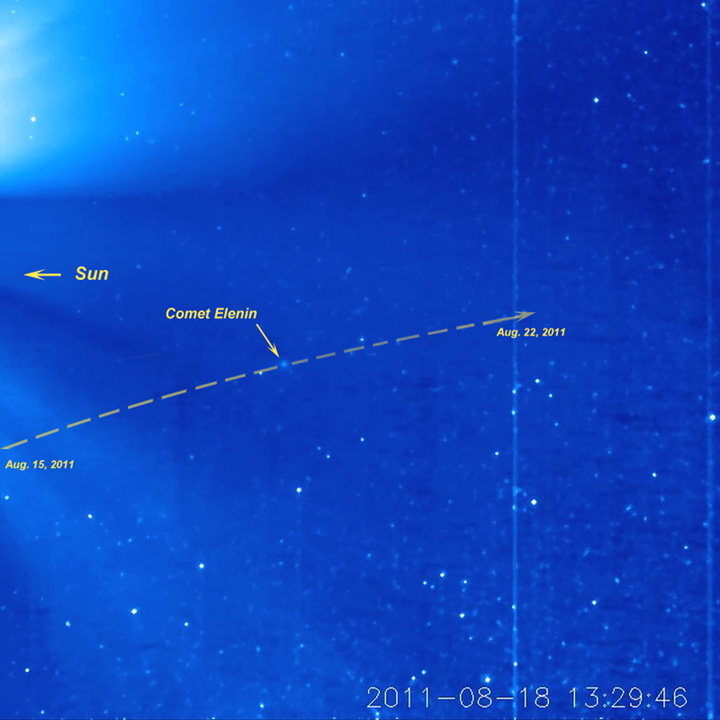 With Comet Elenin in continuous view of STEREOâ€™s (Behind) Heliospheric Imager 1, we can follow its progress across space as it moves from left to right in the video clip (Aug. 15-22, 2011). The comet appears as a fuzzy blob, though occasionally a smudge its comet tail can be made out. At its closest point to us, the comet will be about 35 million kilometers (about 22 million miles) from Earth on Oct. 16. By late August, it will be visible to us here on Earth, but it is still likely going to be hard to see with the naked eye. 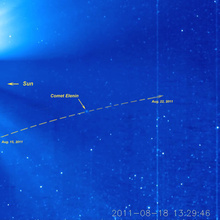 The SOHO spacecraft should be able to observe this comet for six days starting Sept. 23. Comets are basically old dust and ice balls that occasionally visit our inner solar system. The bright object that appears at the beginning of the clip is Jupiter and near the end of the clip Mercury appears.